Encompassing fifty miles of secluded shores and tranquil waters, the Helford River remains one of Cornwall’s most cherished wild places and a much sought-after location for an idyllic cottage holiday. From craggy bights and sun-drenched mudflats to tree-lined creeks and sparkling waters, this magnificent river plays host to a vast array of captivating wildlife while also providing the most enchanting escape for boaters. Enjoy a paddle on Frenchman’s Creek – one of the seven secluded and serene creeks that run off the River Helford – courtesy of Koru Guided Paddle Adventures. Set out from Budock Vean beach and paddle towards Helford Passage passing sail boats and beneath the boughs of ancient oak trees. Frenchman’s Creek was the inspiration for one of romantic novelist Daphne du Maurier’s most famous books ‘Frenchman’s Creek’ and is characterised by its many quiet, sandy shores and captivating ship wrecks which lie weed-covered, beached and in the shade of low-slung branches – the ideal fishing perches for hungry herons. Set on the banks of the Helford River near the charming coastal village of Gweek, The Cornish Seal Sanctuary started life as a small rescue centre for distressed or orphaned seals and oil-slicked birds. Over the years, the centre has cared for many other marine creatures, such as dolphins and turtles, and today houses a specially designed hospital as well as a nursery and convalescence and resident pools all with the aim of returning injured seals back into the wild. Visitors can spend time with seal pups and watch the rescue workers as they carry out their day-to-day duties while also viewing the seals swimming underwater via aquatic viewing scopes. Another setting which proved inspirational for Daphne du Maurier during the writing of her swashbuckling novel, Frenchman’s Creek, are the historic grounds of Trelowarren Estate. Surrounded by one thousand acres of spectacular Cornish countryside and stunning botanical gardens, the estate is open from April to September when you’ll be able to enjoy beautiful woodland walks and discover some of this ancient county’s most edifying landmarks, including a Victorian folly, an Iron Age hill fort, and The Lizard’s highest vantage point. The Manor of Trelowarren dates back to the 11th century and appears in the Domesday Book having been farmed and forested through the ages. The beautiful valley walks of Glendurgan are something to savour. Surround yourselves with exotic flower blooms that thrive in the sheltered lowlands before strolling amidst the dazzling array of wild flowers that flourish on the sunnier uplands. The garden trail will lead you to the picturesque hamlet of Durgan on the Helford River, a quiet setting where you can while away an hour or two disturbed only be the odd wading bird or passing sailing boat. This stunning location is a haven for wildlife and magnificent flora, not least the gargantuan tulip-tree deep rooted above the old cherry orchard. Spend an afternoon exploring the gentle meanderings of the Helford River with a boat tour helmed by a skipper from Helford River Cruises. This memorable trip aboard The Hannah Molly – a nineteen-foot cabin cruiser – begins from a small jetty off the tropical gardens of Budock Vean. From here on in, all you have to do is sit back and enjoy one of Cornwall’s most serene river boat experiences as you chug along the sea-bound current. Enjoy a sumptuous and hearty lunch at one of Cornwall’s loveliest riverside pubs. The Ferry Boat Inn is located in Helford Passage and is surrounded by rolling green pastures and wooded banks. Here, you can sit on the open terrace and take in the breathtaking scenery while indulging in The Ferry Boat’s delicious menu. Where better place to finish your relaxing riverbank walk than this historic hostelry and yachtsman’s haunt. During the autumnal and winter months, you’ll be greeted by a roaring log fire, the perfect backdrop for a traditional Sunday roast. Based on the sparkling Helford River near the idyllic hamlet of Durgan is SUP Hire Cornwall, a stand-up paddle board company boasting a fleet of premium boards for hire. Whether you want to bask in the morning sunshine or enjoy a gentle evening saunter, SUP Hire Cornwall have a package to suit your every need. There’s no better way to experience the Helford River and share in all of its beauty than gliding along its gentle waters. 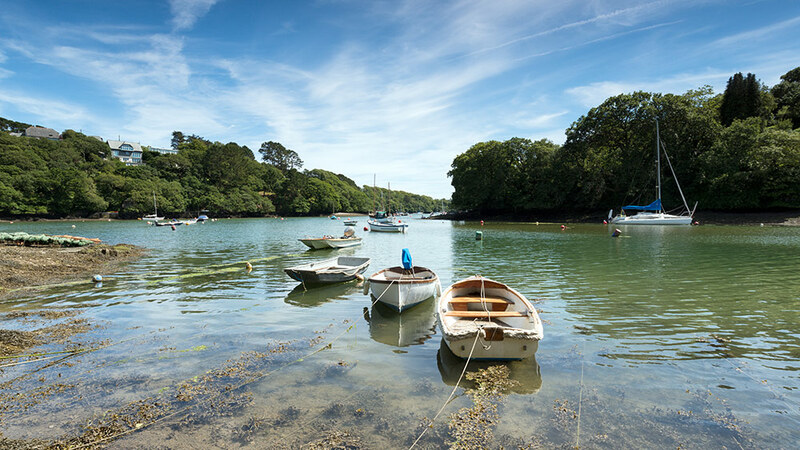 From the sunken water gardens of Rosemullion Head to the tranquil shores of Frenchman’s Creek, The Helford River provides some of the region’s most stunning and scenic walks. If you’re in the mood for a memorable circular stroll along these much-loved backwaters the iWalk Cornwall app can place several popular trails at your fingertips! With GPS guided route mapping plus boundless knowledge and detailed information, you’ll feel totally at ease under the expert direction of iWalk Cornwall and won’t miss a stile or waymark. Designed by renowned golf course architect James Braid, the greens and fairways of Budock Vean are amongst the finest in the South West. If you enjoy a round of golf and fancy pitting your wits against the mature and meticulously manicured Budock Vean parklands, then book a spot on this superb eighteen-hole course. From the opening tee at Hickman’s Hill to the tricky one hundred and forty-eight yards of the ‘Flower Bowl’ that sweep towards the eighteenth pin, this golfer’s retreat is not to be missed! Smuggle the family away to a cosy Helford River holiday cottage and lose yourselves in one of the South West’s most cherished beauty spots.